Prepare yourself for a new personal computing experience with the Athlon II X2 250. Save time and accomplish more with multi-core processing that makes multitasking quick and simple. The Athlon II X2 features the next-generation AMD Direct Connect Architecture for a fast, responsive PC. This processor is also optimized to take advantage of the power management features in Windows 7 using AMD PowerNow! 3.0 Technology. Energy efficiency is important to AMD, allowing you to enjoy a cool, quiet PC while saving energy and reducing heat, noise and the effect of your computer on the environment. Energy efficiency innovations include Cool’n’Quiet, AMD CoolCore and AMD Smart fetch. These technologies reduce power consumption and processor activity. You’ll experience up to 50% energy efficiency over previous AMD Athlon processors. 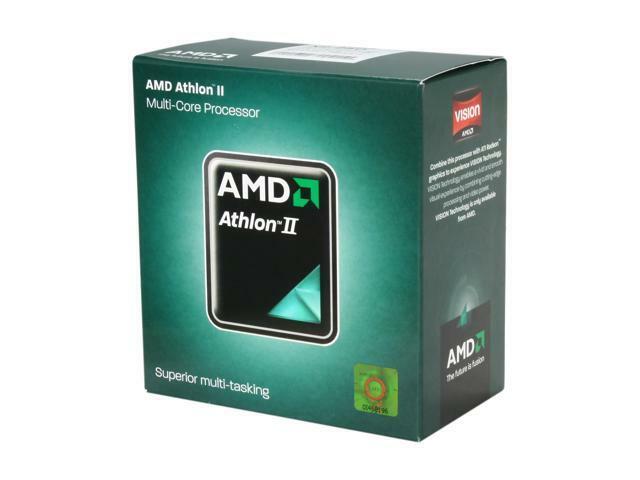 AMD Athlon II processors also offer support for Virtualization Technology. You can run virtual environments on one system with ease, allowing you to use legacy programs on a separate operating system. Add the convenience and power of multi-core processing and enjoy the benefits of energy efficiency with an AMD Athlon II X2 250 today! AMD64 with Direct Connect Architecture AMD64 technology allows the Athlon II X2 250 processor to run 32-bit applications at full speed while enabling a new generation of powerful 64-bit software applications. Moreover, all AMD Athlon II processors are built on AMD’s revolutionary Direct Connect Architecture, where processors are directly connected to one another. An I/O and memory subsystem is also directly connected to each processor core, helping improve overall system performance and efficiency. Integrated Memory Controller The AMD Athlon II X2 250 processor features a high-bandwidth, low-latency integrated memory controller that directly connects the processor to memory for optimum performance, low latency, and high throughput. HyperTransport 3.0 Technology HyperTransport Technology (HT or HTT) is a high-speed, low latency, point-to-point link designed to increase communication speeds between integrated circuits in computers, servers, embedded systems, and networking and telecommunications equipment. With HT 3.0 technology the AMD Athlon II X2 250 dual-core processor enjoys 4000MHz system bus speeds. PowerNow! 3.0 Technology CPU power management technologies featured in AMD PowerNow! 3.0 Technology like AMD's Cool'n'Quiet 3.0 and AMD CoolCore result in proven, measurable benefits for businesses and consumers, including reduced power usage, lower energy costs, and greener PC operation. Pros: On 24/7 since purchase. Pros: Great chip, going on 4 years now. No complaints, no problems. Smooth sailing since day 1. Other Thoughts: I am about to update my system with the A10 7850K, not out of need, but because I want to. This Athlon is still going strong after all this time. Pros: Good, cheap dual core processor. Runs well with no real issues. Other Thoughts: I've had my 250 for about a year. With a Biostar mobo I hit 3.72Ghz (fully stable). I switched to a cheap MSI board and was only able to hit 3.66Ghz (fully stable) after dialing back the RAM settings and using a water cooler. So, a full year at 3.66Ghz. It's been able to handle everything I've thrown at it, but some of the newer games optimized for 2 or more cores are starting to tax it a bit, (Black Ops 2 MP is really hard on it for some reason, but a RAM stick was near death so it might of been the reason) so I'll be upgrading to a new FX chip soon. If you want an inexpensive chip for day to day or middle of the road gaming, go for it. It also runs fairly cool, even under load. Pros: Decent clock for a dual core, and on the cheap too. Runs perfect for the inlaws computer. Other Thoughts: good low powered dual core on am3 platform. Pros: Bought it to be the centerpeice of a carputer media center in my trunk. Works well, no issues at all. Pros: Its a CPU. cost less than my 6000+. Cons: Seems to be running slower than my old 6000+. Benchmarks all confirm it is running slower.